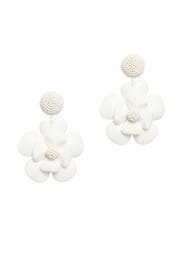 Plastic flower accents dangling from beaded globes make these clip-on white earrings from Sachin & Babi Accessories a versatile and romantic addition to your favorite summer looks. White glass beaded earrings with white plastic flower drop accent. Clip backs with comfort pads. 3" long.